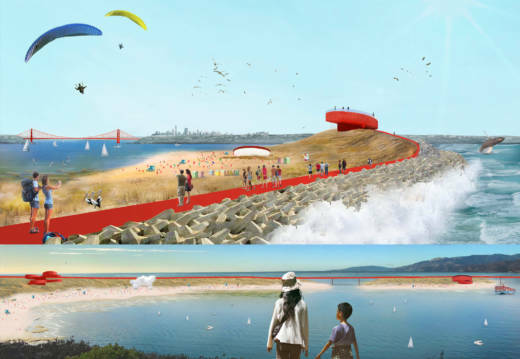 After months of study, ten carefully-picked design teams are unveiling their first ideas for giving the Bay Area a makeover to cope with rising sea levels. It's the latest phase of the Resilient by Design challenge, which aims for nothing less than the remaking of waterfront communities with forward-looking design. "There's been lots of study but [now] there's urgency and it's time to act," says Marcel Wilson, who represents the San Francisco-based "Bionic" design team (named for the San Francisco design firm). "It's time for invention." Much of the invention on display this week involves reconnecting communities to the Bay, after being cut off by freeways, airports, and other infrastructure. The Bionic team identified San Rafael in Marin County as one of the areas under the most immediate threat from rising waters. This video, produced by the team, illustrates the "disconnection" between residents and the Bay. "Many of the wrong relationships with the Bay were set up long ago. This is the era to remake the Bay and correct those -- reorganize cities so life and culture is more a part of the estuary." That would literally be the case if some of the teams' proposals come to fruition. Rather than retreating from the Bay's rising waters (let's face it, where would it all go? 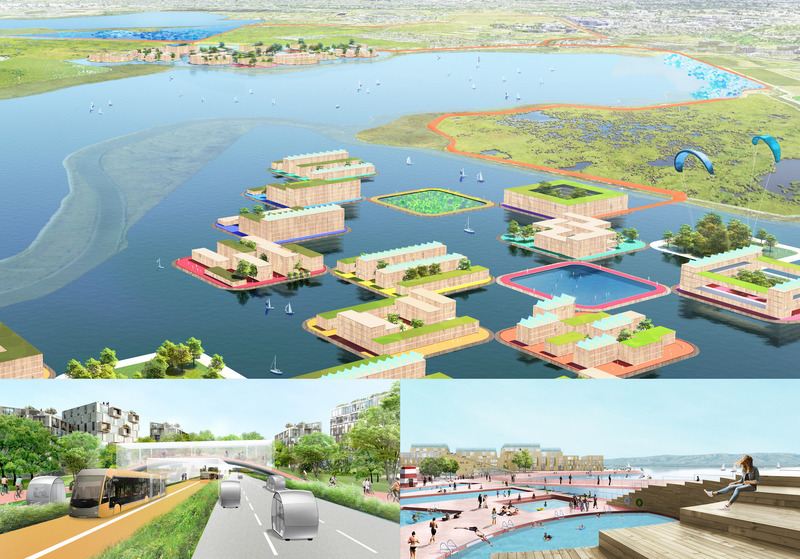 ), several visions call for floating -- if not entire cities -- at least parts of them on artificial islands. "Run into the flood, not away from it," advises Wilson. "It's not wet and dry, it's more about a zone between the Bay and upland, and designing and thinking about adapting and living with water, versus thinking about them separate -- that's the future." Richard Kennedy agrees. His Field Operations team wants to create an "absorptive mosaic" around the Bay. Such lofty (and costly) ambitions are encouraged by the projects' organizers. Henk Ovink, a Dutch planning guru and advisor to the challenge, told the assembled teams, "You are not here for the low-hanging fruit. You are here for the high-hanging fruit." In other words, wherever your imaginations take you, go for it. Some were taken into the mud, literally. The team dubbed "Public Sediment" chose to focus on leveraging wetlands as natural sponges to absorb encroaching waters, though team member Gena Wirth from New York cautioned that there is "no silver-bullet solution" to coping with seas that could rise a foot or more by 2050, driven by global warming. The extent of encroachment in San Francisco Bay will vary, depending on location and topography. "There's enormous risk and threat, and the level of awareness is very low." says Wilson. So his team has printed up "floodline" stickers, which they're handing out to people with instructions to place them anywhere that's about nine inches above ground, indicating the anticipated bay level about a decade from now. "I think a lot of people are left with the feeling of, 'Where do you start?'" With stickers, evidently. The project's advisory board will spend a few weeks studying the proposals and then pair up teams with communities around the Bay to start discussing implementation and funding. Financing will be a hurdle. "We can't think of these places in isolation," says Wilson. "Our economies, our ecologies are interconnected. So, this is something for the region to understand and the region to fund." All of the team videos and other visuals are available on the RBD website, where organizers are encouraging public comment through December 1 on the 32 "design opportunities" presented by the teams.